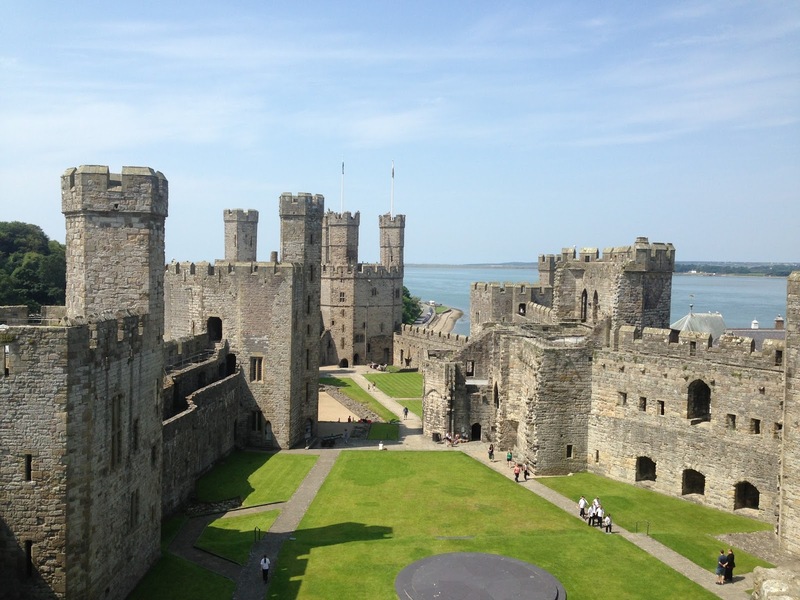 Wales is dotted with spectacular castles, but perhaps some of the finest were built in the late 1200s by the English monarch, King Edward I, as he battled the Welsh for dominion of these wild lands. Exploring a handful of them provided a unique insight into the history of this beautiful country. Plus castles are really fun. Knights? Ale? Battles? Betrayal? Yes please. I’ve missed season three of Game of Thrones and am in deep remission. Bring on some castles and northmen, please. Wales was under Roman rule until the 5th century, when the Romans packed up and the Welsh people formed distinct kingdoms. Internal struggles for power over the kingdoms and external pressure from the English crown eventually saw Wales under English rule (but not without several major revolts). With intermittent periods of peace and various segments of Wales swaying between English and Welsh rule, it all gets a bit complex. By 1246, Llywelyn ap Gruffydd was Prince of Wales and at war with England. The following year, he was forced to submit to King Henry, who claimed a significant wedge of Wales in retribution. With this intermittent peace, Llywelyn then had to fend off his older brother, Owain Goch, and his younger brother Dafydd for his claim to the remaining Welsh kingdoms. Owain was imprisoned but somehow Dafydd talked his way out of it and promised to faithfully serve his brother Llywelyn. It wasn’t long before another Welsh uprising against the English, resulting in reclamation of the lands taken by King Henry. At this stage, Daffyd again betrayed his brother and switched sides to aid the English. After prolonged skirmishes, in 1267, Llywelyn and Henry signed the Treaty of Montgomery which recognised Llywelyn’s right to Wales and the title ‘Prince of Wales’, while Dafydd sulked away in England. Yet by 1272 King Henry was dead and his son Edward became king. King Edward I was not so forgiving and again declared war against Wales in 1276. Daffyd changed sides again and rejoined his brother Llywelyn (who strangely accepted him back). King Edward I spent the next twenty years building an ‘iron ring’ of castles in north-west Wales to solidify his position, while Llewelyn’s forces used the natural fortress of Snowdonia from which to base their attacks. The largest and finest of the new castles were situated at Caernarfon, Beaumaris and Conwy and collectively form a World Heritage site today. Llywelyn was killed in 1282 and Dafydd finally got what he wanted – the position of Prince of Wales. However, the very next year he was captured and sentenced by King Edward I to a painful death: Dafydd was dragged behind a horse to the gallows, hung, but cut down while he still lived to be drawn and quartered. In 1284 the Statute of Rhuddlan came into effect which imposed English law over the Welsh and crushed the revolt. The castles still remain and form a powerful legacy that is testament to both the English and Welsh forces. With the warm weather happily continuing, Lyndsay and I ventured out to the charming city of Caernarfon. In the sudden onset of sunshine, it seemed that every male had abandoned shirt-wearing and there were plenty of sunburned shoulders and backs on display. Yet the local Brits pottered along the cobbled streets happily, toting dripping ice creams or pints of beer (age respectively). Against such a backdrop, the enormous fortress of Caernarfon Castle rises above the sea somewhat ominously. It served as the administrative heart of north Wales during King Edward I’s foray into Wales. Not only that, it formed a sort of palace where the King could retire in safety and comfort to oversee the war. The strong, high walls mimic the design of Constantinople and are strengthened by seven enormous polygonal towers. Needless to say, it’s rather splendid and Lyndsay and I spent nearly four hours climbing the impressive walls and towers. Nowadays the title ‘Prince of Wales’ is given to to sons of the reigning English monarch in an almost willy-nilly fashion. The coronations take place at Caernarfon Castle, with the most recent being that of an 18-year old Prince Charles. He was so adorable with his sweaters and big ears back then. A walk along the waterfront and docks in the sunshine with the castle ever-present in the skyline was simply stunning. On the way back, a friendly hello to a couple lounging by their campervan turned into a 30 min chat that we were hard-pressed to extricate ourselves from. They were a lovely pair of retirees from Liverpool who felt obliged to inform us of their favourite places in Wales. A map was even pulled out at one stage, which was then used to trace the various cycle routes they’d taken on previous trips and to enthusiastically jab at the locations of towns with good pubs by the sea. When they asked if we were together I unwittingly assumed they meant whether we were travelling together, so I nodded, while mentally scrambling to work out a way to politely finish the conversation so Lyndsay and I could race for the last bus. Thus we left this pair of retirees grilling their fresh-caught fish, contemplating the lovely Australian couple they’d just met. It wasn’t until I replayed the conversation on the bus later on that I realised my error. Oh well, I’m sure we spiced up their afternoon. On the crest of the Eagle Tower, Caernarfon Castle. Lyndsay and I headed up to Conwy for a weekend to explore Conwy Castle and Beaumaris Castle (on the neighbouring island of Anglesey). Conwy is a gorgeous city in northern Wales, still partially bounded by high city walls. Both Caernarfon and Conwy castles originally included a surrounding walled city, inhabited by English settlers and merchants while the Welsh simmered furiously outside the walls. 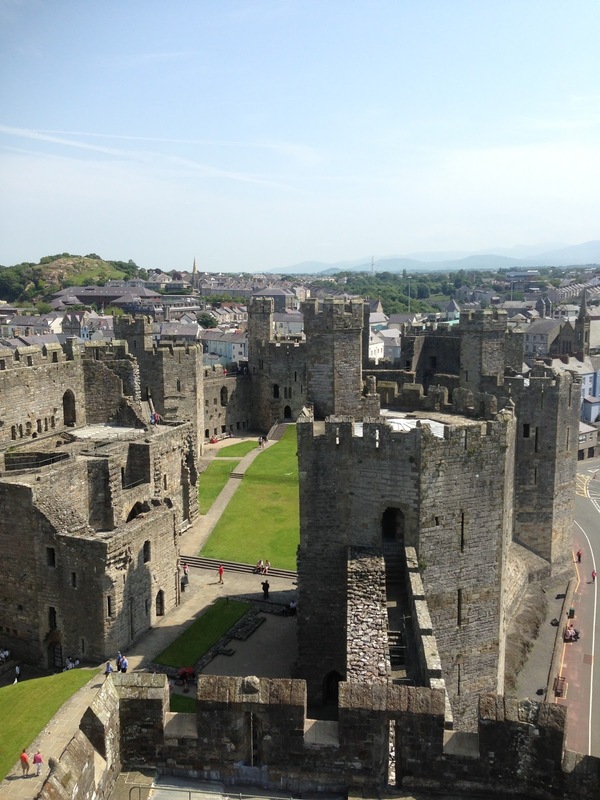 At Caernarfon, only remnants remain, while at Conwy it is possible to climb the walls and walk the battlements for about half the length of the original structure. It’s pretty impressive as is, not to mention how it would have appeared during the Welsh-English struggles. Walking along the length of the walls brings you down to the harbour, dotted with beached boats at low tide. Like at Caernarfon, the local population seemed to have developed an aversion to suitable outerwear and children ran amok with ice creams and sandcastle pails along the harbour. The smell of fish and chips dominated the air and the harbourside pub was chock full of suitably sunburned patrons. It was a lovely festive atmosphere. The castle itself sits on a huge rock outcrop just back from the harbour, with eight high towers and two raised gateways, making the fortress nearly impenetrable. 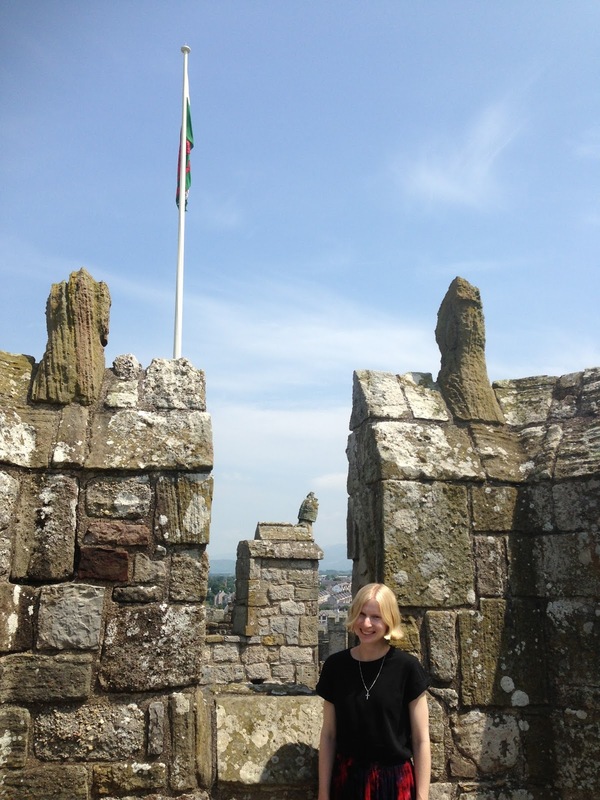 The views from the battlements and towers are stunning vistas over the sea and the mountains. As an aside, the nearby Bodnant Gardens were also well worth a morning’s wander. 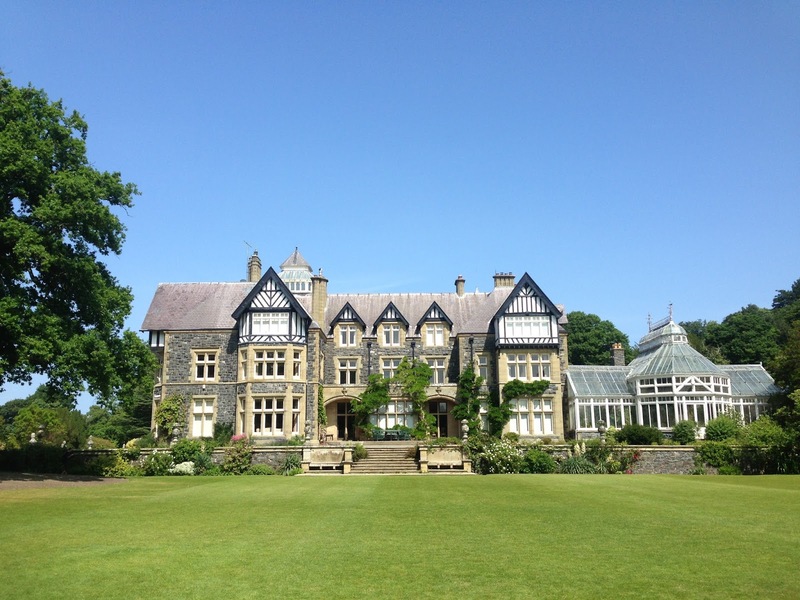 On the river Conwy and with views back to Snowdonia, it’s a lavish combination of wilderness, valleys and tended terraces sprawling over 80 acres. It was begun in 1875 by the Aberconway family and developed by this same family over the next 130 odd years before being given to the National Trust in 1949. Conwy definitely made an impression – this cute town had plenty of character, although this may just be sunshine speaking. The YHA up on the hill (although devastating to drag one’s bag to) was perched in the perfect vantage point for tranquil views over the mountains and harbour. View from the castle over the sea. Pretty stunning. View from the town walls over Conwy, with the castle in the background. Bodnant House, Bodnant Gardens, Conwy. Above the rose arbor, Bodnant Gardens. On the isle of Anglesey is Beaumaris Castle, the last to be built by King Edward. It shows because the castle is unfinished, yet despite this it still astounds. It’s completely symmetrical and incorporates four levels of fortification.In King Edward’s time, the sea level was higher and the castle had its own sea-dock. An impressive moat still remains although the sea is no longer close to the walls. Nowadays it’s quite effective at keeping out the cows. 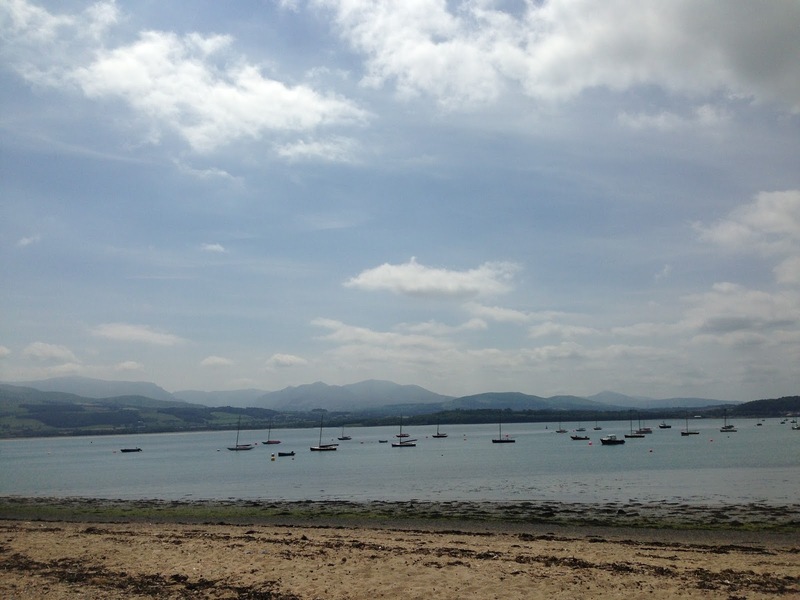 If it’s possible, Beaumaris was even more crammed full of jaunty beach-goers than Conwy, with families setting up elaborate picnics by the harbour in droves, some even bringing caravans for full amenities. Seagulls fought savagely over abandoned chips and the world went on despite the terrible Australian loss of the Ashes. 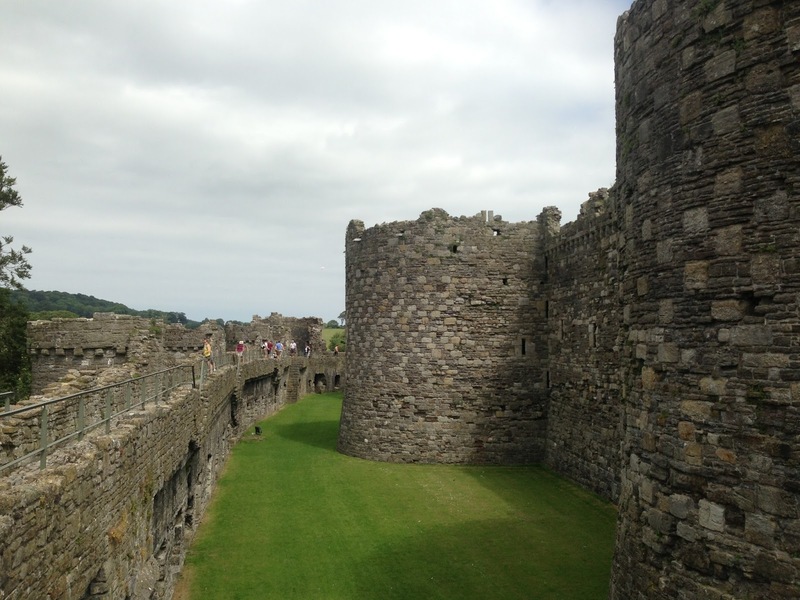 Outer and inner walls of Beaumaris Castle.